A perfect record stayed intact for the West Valley Middle School girls basketball team. 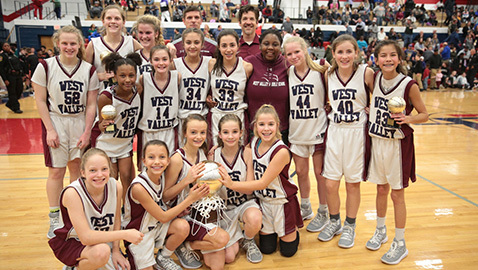 The Lady Wolves also won the James A. Ivey Jr. Memorial Basketball Tournament Thursday night. But it was perhaps the toughest test of the season. The Lady Beavers were stingy out of the gate as they held West Valley to just five points during the opening six minutes. Trouble was, Karns managed just two points of its own in the first quarter. But it was evident that the Lady Beavers came prepared to battle and they weren’t going to go quietly. The Lady Wolves, the Lady Beavers and Farragut Middle (which defeated Powell 46-28 in the third-place game on Thursday afternoon) all advance to the sectional tournament on Saturday, Jan. 26 at Hardin Valley Middle School. Pairings and game times were not available at press time. Karns more than held its own against West Valley early in the title tilt. The Lady Beavers were 11-10 when Judea Taylor buried a 3-point shot with 1 minute, 15 seconds remaining before halftime. Avery Treadwell, West Valley’s eighth grade post player who was named the tournament’s Most Valuable Player, made a layup with 17.2 seconds left in the second stanza. Karns kept her in check early as she scored just five points before halftime. But she would finish the contest with 15 points to lead all scorers. Brinley Murphy finished with 10 points (all after halftime). Annalise Bishop added six and Sharon Wilson scored five points in the game. Wilson, Murphy and Bishop all joined Treadwell on the all-tournament team along with Judea Taylor (who led the Lady Beavers with 10 points), Sammy Taylor and Javiana Pendergrass. Murphy said that the Lady Wolves didn’t panic when they were embroiled in the defensive struggle that was the first half. Ballard noted that he was pleased with the way his team responded after halftime. “We came out in the second half and we started playing ball,” he said.